Yea for Thanksgiving! 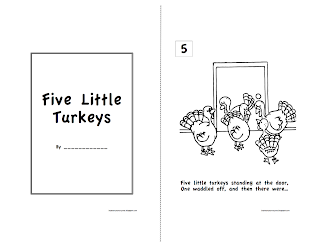 I thought I'd try my hand at making a little coloring book/story book to the poem "Five Little Turkeys". So, here it is, I hope you like it! I'm also trying new software so bear with me while I figure it out. Just print the pages, cut on the dotted line, and staple together (don't be fooled by the numbers. They actually go backwards). It means there is only one side of the page, but it keeps it simple. Also, don't forget to check out my Thanksgiving "Don't Eat Pete!" game for even more turkey fun :) Enjoy! Make sure you download the pictures instead of printing directly from the blog, so it sizes correctly!